Having a Videocon Infinium Z41 Lite Plus is like carrying sparkling jewelry in your hand for its silver color and design finish. But from a broader perspective, the features of the Videocon Infinium Z41 Lite Plus are sufficient for our basic needs. The price of the Videocon Infinium Z41 Lite Plus is INR. 2199. The device comes with a 4-inch WVGA display with decent clarity. The operating system of the phone is Android KitKat v4.4. When it comes to your multimedia files, the device is equipped with a storage capacity of 4GB. The phone has a 3.2 Megapixel primary camera with a flash support to click pictures in the dark. A 0.3 Megapixel secondary camera is also provided for selfies. The battery has a capacity of 1450mAh giving up to 6 hours talk time. 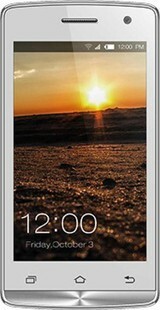 An attention seeking factor of this phone is that it supports 3G network for a faster internet speed. As mentioned above, the Videocon Infinium Z41 Lite Plus has a sparkling appearance and the body is 10.3mm sleek giving you a better grip to hold. The back cover of the phone is textured to avoid scratches and gives the device good aesthetics. In conclusion, the Videocon Infinium Z41 Lite Plus is a very general smartphone available in the market at an inexpensive rate. But it is always good to check out other phones if you are looking for specific features in a smartphone. Videocon Infinium Z41 Lite Plus full specs and reviews as of Apr 2019. Buy it here!